Recommended for non-porous surfaces, this Bostik Blu Tack Reusable Adhesive can be used on vinyl coated wallpapers, painted surfaces, glass, metal and more. It is available in strips for convenience of the user. Permanently plastic and reusable, this Blu Tack adhesive can be used for straightening paintings and picture frames or holding mouse mats and floral arrangements in place. It can also be used to stop temporary leaks. 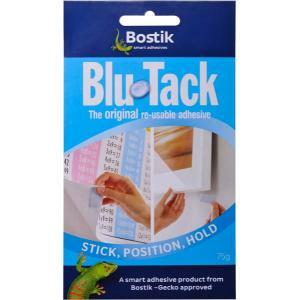 This Bostik Blu Tack adhesive is non-toxic, making it safe even for children. Permanently plastic, reusable multi-purpose adhesive. Blu-Tack is recommended for use on non-porous surfaces such as vinyl coated wallpapers, painted surfaces, glass, metal etc. Holds up posters, cards, certificates etc.